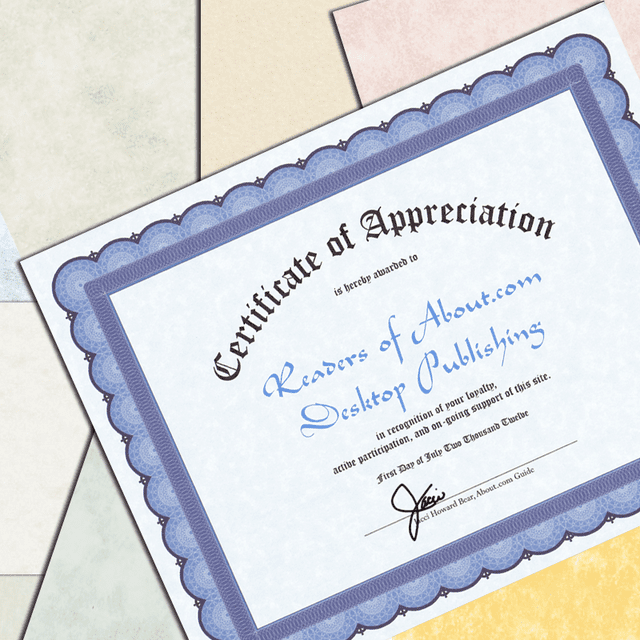 Print your certificates on parchment papers, granite textured papers, marbled papers, or others with light colors. The certificate shown is a scan of one printed on light blue parchment paper. The popularity of recognition certificates is undeniable at homes, schools, and offices. If you have Microsoft Word, you can use it to make certificates of recognition that will thrill the recipients. 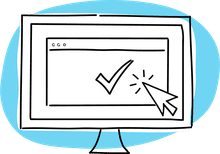 This quick tutorial walks you through the process of setting up your Word file, adding the type and printing your own professional-looking certificates. Download a Word certificate template online. The Microsoft templates have fancy, embellished borders that are standard for certificates. If you have a lot of certificates to print, you may prefer to buy pre-printed certificate stock at your local office supply store. Pre-printed certificate paper is available with a wide range of colored borders. It adds a professional touch to the certificates. Open Microsoft Word but don't insert the template just yet. You need to set up your document first. Word opens to a letter size document by default. You need to change it to landscape orientation so it is wider than it is tall. Change the orientation by clicking Orientation and then Landscape. Set the margins. The Word default is 1 inch, but if you are using purchased paper rather than a template, measure the printable portion of the certificate paper and adjust the margins to match. If you are using a template, go to the Insert tab and click Picture. Go to the certificate image file and click Insert to place the template in the document file. To put text on top of the certificate image, turn off text wrap. Go to Picture Tools and select the Format tab > Wrap Text > Behind Text. Now your file is ready for you to personalize the certificate. Title. This can be something like Award of Excellence or Certificate of Achievement. Presentation line. The presentation line usually says is hereby presented to or is awarded to. Recipient's name. The name of the person, group or organization receiving the award. The name of the person or organization that is presenting the award. A description of the reason for the award, such as for outstanding salesman of the month. The date the award was earned or was presented. A signature line or lines where representatives of a company sign the certificate. When you are entering this information on the certificate, center most of the lines on the page until you get to the date and signature line. They are usually set to the far left and far right of the certificate. A word about fonts. The title and the recipient's name usually are set in a larger size than the rest of the certificate. If you have an "Old English" style font or similar elaborate font, use it for the certificate title only. Use a plain, easily read font for the rest of the certificate. Print out one copy of the certificate and proofread it carefully. This is the time to tweak the placement of any type of the certificate so it looks just right. If you are printing on pre-printed certificate paper, load it into the printer and print one more certificate to check the placement within the border. Adjust if necessary and then print the final certificate. How Do You Choose the Right Wording for Certificates? What Paper Do You Use for Homemade Award Certificates?